A connected platform to automate your processes for Anti-Money Laundering (AML) and Know Your Customer (KYC) — seamlessly delivered via a beautiful Web Portal and an intuitive API. SwiftDil offers a complete framework for businesses looking to fully automate their KYC and AML processes in a cost effective fashion. It's built from the ground up to cater for companies of all sizes. SwiftDil has a rich set of powerful tools for your AML and KYC compliance needs. Whether you are creating a payments wallet, a lending platform, a remittance business, a cryptocurrency business, or looking to launch an Initial Coin Offering (ICO), SwiftDil have got you covered. We believe that AML and KYC compliance is a problem rooted in complex applications and processes. We persistently seek out elegant, composable abstractions that enable robust, scalable and flexible integrations through our API. Because we eliminate needless complexity and extraneous details, you can get up and running with SwiftDil in just a couple of minutes. Our Web Portal offers effective and off-the-shelf solution for businesses of all sizes. The portal enables you to manage and screen your customers with a couple of clicks. Using cutting-edge technologies, we've built a set of clean and easy-to-integrate API and Web Portal that will enable you to build scalable and innovative products. Screen individuals and companies against our global sanctions, watchlists, adverse , and politically exposed persons (PEPs) database. Instantly verify various types of documents, such as passports and driving licenses, from a growing list of over 208 countries. 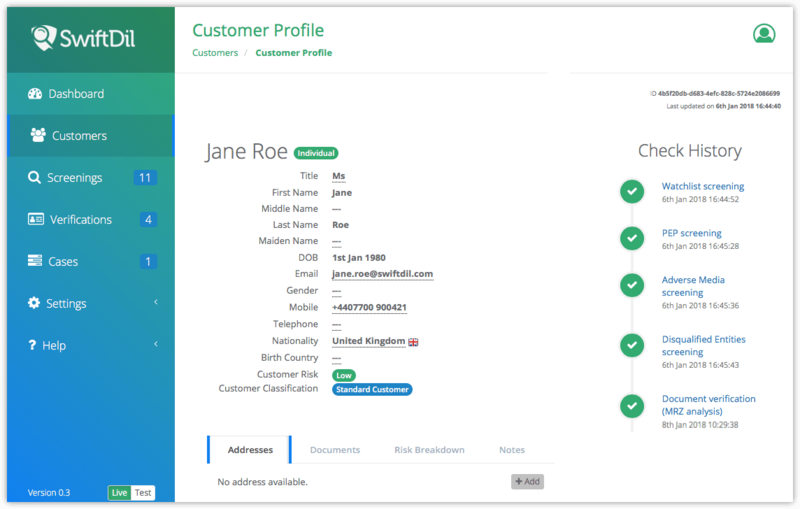 Keep on top of Ongoing Customer Due Diligence (ODD) commitments using our real-time notifications should a customer's status change. We apply proprietary algorithms to appraise your customers risk profile and presents you with a simple low, medium or high score. Take advantage of our advanced facial recognition algorithms to ensure that your customer's selfie matches their ID photo. Acquire rich information on companies from over 100 jurisdictions around the world, and the people who run them. Powerful solution at a price suited for any budget. High volumes? Different business model? Custom requirements? Get in touch and our friendly team will be happy to assist you. Fill in the form below to gain immediate access to our API and Web Portal sandbox environment. We won't bother you... promise!